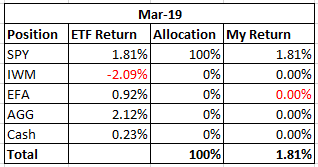 In March AGG had the best return of the four ETFs I follow for my retirement portfolio. SPY had a solid gain that I captured. IWM was the only ETF I follow that declined and it remains in bearish alignment. The stock market continued its rally that started in January and it looks to continue moving forward according to my methodology. The market, as measured by the S&P 500 index, gained 1.79% in March. As for my pension plan assets, I had a 1.81% return in March due to being 100% allocated in SPY. Consequently both of my investment objectives were met. I preserved my capital by making money and I met the second investment objective which is beating the S&P 500 index as measured by the ETF SPY. 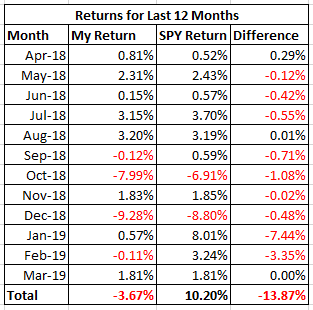 Table 1 below shows my returns and allocations for the month of March and Table 2 below shows my returns for the past 12 months. To review the purpose of this series of articles, my retirement account only allows me to buy the following four ETFs: iShares Core U.S. Aggregate Bond ETF (AGG), SPDR S&P 500 ETF (SPY), iShares Russell 2000 ETF (IWM), and iShares MSCI EAFE ETF (EFA). I can also have my money in cash. The question is how to decide where and when to allocate money to these various ETFs. I use my moving average crossover system combined with relative strength charts to determine how to allocate my pension plan assets. My moving average crossover system uses the 6 month and the 10 month exponential moving averages to identify which of the four ETFs are in a position to be bought. If the 6 month moving average is above the 10 month moving average then the ETF is a buy. I call this setup being in bullish alignment. When the 6 month moving average is below the 10 month moving average the setup is referred to as a bearish alignment. When a bearish alignment happens, I don’t want to hold that asset. See Chart 1 below for a long-term look at the S&P 500 index using my moving average crossover system. You can see that the moving average crossover system provided some excellent long term buy and sell signals that would have allowed investors to capture long duration moves in the index; while avoiding costly drawdowns. Avoiding these costly drawdowns allows me to meet the objective of capital preservation. I employ this strategy because I do not want to experience a large drawdown with my pension assets. During the 2008 - 2009 market crash many people didn't even look at their retirement statements because they were afraid of what they would find. I submit that if those people would have used a market strategy similar to what I outline in this series of articles, they would have been able to avoid much of the decline during the bear market and consequently would have had less emotional stress during that time period. The following charts show the current status of the ETFs that I am allowed to buy in my retirement account. Chart 2 shows that SPY gained 1.81% in March. The two moving averages are in bullish alignment and there is growing white space between the two moving averages which is bullish. I also like that the volume increased over last month which I also consider to be bullish. After having a positive month in February, IWM lost 2.09% in March. Chart 3 shows that IWM remains in bearish alignment. Volume increased during a month in which IWM declined, which is considered bearish. All this leads me to avoid IWM in April. Chart 4 shows the relative strength of IWM compared to SPY. IWM underperformed SPY by almost 4% in March. The relative strength ratio remains inside the downward sloping blue channel. That is bearish. Until this ratio breaks above the channel I will not hold IWM in my portfolio. EFA gained 0.92% in March. EFA remains inside the falling wedge pattern that was discussed last week. EFA remains in a bearish alignment. That could change if EFA breaks above the falling wedge pattern, but it remains to be seen. I will stay out of EFA until I see a bullish alignment setup. Chart 6 shows that EFA underperformed SPY by 0.88% in March. This ratio remains in bearish alignment will be monitored moving forward. Chart 7 shows that EFA strongly outperformed IWM in March by 3.08%. The EFA:IWM ratio has closed back inside the green box. All of that is bullish. The ratio remains in bearish alignment however. It will take the ratio to break above the green box for a long term trend that favors small cap stocks over international stocks to start. I will continue to monitor this ratio. AGG had a strong month moving up 2.12% off of the doji candlestick from February. AGG is in bullish alignment and the two moving averages are starting to get some separation or white space between them. All of that looks bullish. The low volume for the month may be a sign of concern. We will just have to wait and see. AGG’s strong month outperformed SPY by 0.31% as shown in Chart 9. The two moving averages are still in bearish alignment and it looks to me that there is a lot of work to do before this relative strength ratio shows bonds leading stocks for a long duration. Until that changes I will keep away from AGG. AGG was the best performing ETF in March. Chart 9 though shows that investors are still preferring equities over bonds for the long term. Teh light volume in AGG also gives me pause. EFA gained in March, but Chart 6 shows that SPY is outperforming EFA. That leaves SPY or cash for my remaining options. Being in SPY worked out well for me in March and I will stay 100% allocated to SPY in April since SPY remains in bullish alignment. Investors can stay long SPY and other equities that are currently in bullish alignment. If for some reason SPY goes into a bearish alignment condition equity investors will have to reconsider their investment options.